After working all weekend painting at the new house, I've come down with some kind of flu or virus. Who knows what this junk is, but Sunday it started with a sore throat like maybe just allergies, and by yesterday morning I could barely swallow. I'm better today, but have laryngitis. bummer. I'll survive. We did get a lot accomplished over the weekend; our younger kiddo came over to help and between the three of us we finished painting the living areas of the lower level. 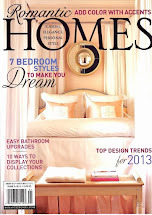 (2 bedrooms, bath, hall, family room, and small kitchen/bar area)... yay! I don't know why I didn't get any finished photos, it was late and I'm sure the lighting wouldn't have been the best. But we can cross that huge job off the list! Here's the World Market Gray Vintage Chandelier I tweaked a couple of weeks ago. It was just installed, so I need to straighten the arms a little, but it helps get this area moving in the direction I'm headed. If you look closely next to the window, you can see the first coat of the Benjamin Moore Smokey Taupe paint. It's a warm browny gray, and I think we'll be using it throughout the house. I had a lot of angst over choosing the color, but after two coats, and getting rid of the original color, it's turning out really pretty. This is an area I didn't show you in the earlier house pics. It's the kitchen eating area, and I knew we were going to change things up in here with a little demolition. Some of you will probably think I've lost my mind, but this is a nice size area, 11x14, and it was completely taken up with cabinets and a counter the previous owner had installed as a homework station for her three kids. 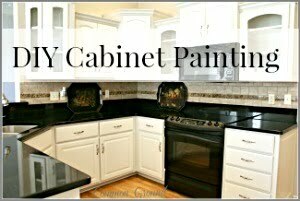 If I were to leave the cabinets and counter, I wouldn't have room for my white kitchen china cabinet or much of anything else. So our guys removed them and are in the process of filling holes and moving electrical outlets. The cabinets are being re-installed in the laundry room, so I'll still have access for kitchen items that I don't use often. I think the space will even out nicely when the furniture gets in. Here's Hubby scrunched into the tv niche in the basement. It's a little larger than the one upstairs. We thought painting it the same color as the walls would help make it look better. We'll see...these tv niche things are making me nuts! I finally decided on area rugs and they came last week. 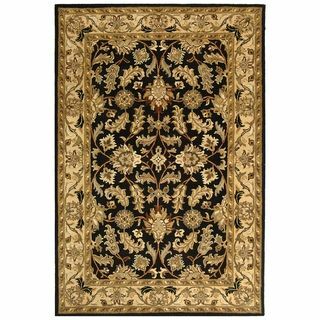 (yes, I just went with the black) They are gorgeous, and have a little trendy take on a traditional oriental rug. (Hint...there's some major pattern going on) Here's a peek. Can't wait to get the painting done to roll these babies out. time for a throat lozenge and a nap. I thought about the paint fumes too, but i painted all last weekend without a problem, plus I was running a fever yesterday, so I guess it's just some junk that I picked up. I'm sure hoping I get into the house in time for some Fall decorating! First and foremost, take care of yourself, dear friend. This sounds similar to the allergic reation I had two years ago to Ragweed & Goldenrod!!! Mine was so~o~o bad that it inflammed the vocal folds in my throat and I could barely breathe. I couldn't speak or vocalize for nearly 6 months. If I had done so, I would have permanently damaged the vocal cords. NOW. . .the paint color is gorgeous!!! 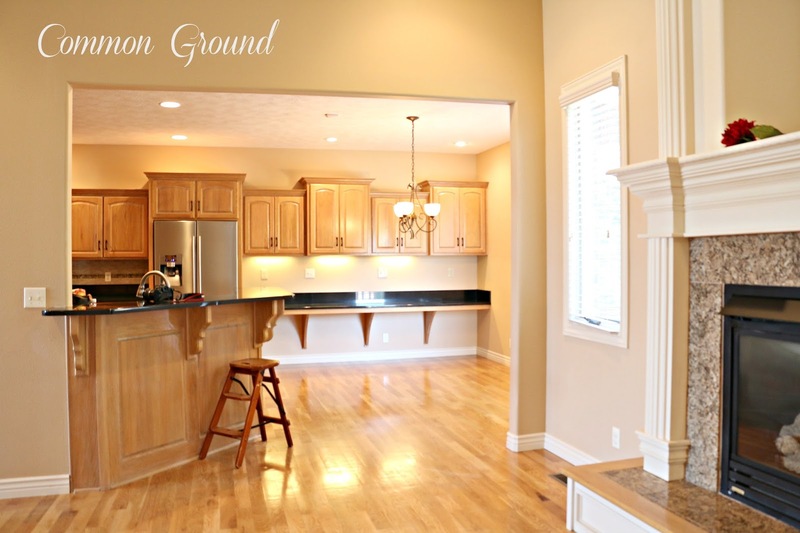 I'm in total agreement to remove those built~in counters and add the cabinets to another area! Love, LOVE, L O V E the rug choice!!! but get lots of rest and take good care of yourself!!! Such great progress! 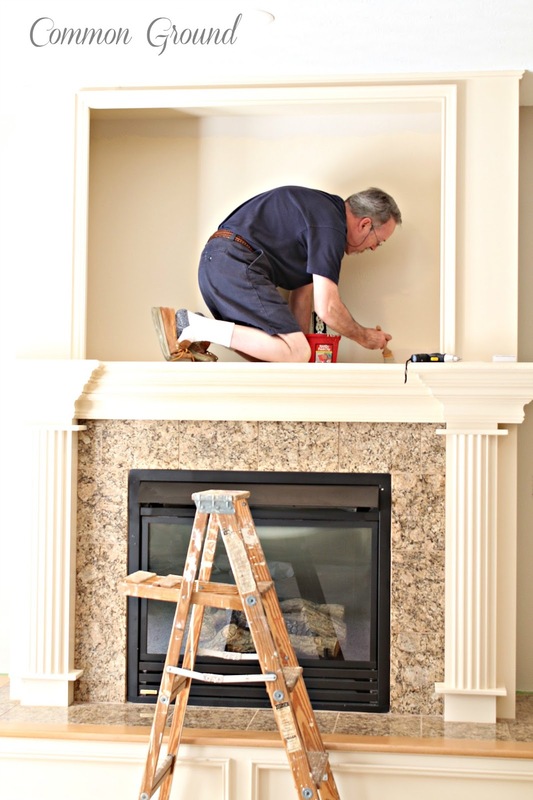 If my husband got in that niche, I'd have to call the fire dept to get him out with jaws of life! And I don't think you're crazy at all to take the counter & cabinets out - you'll use it much better in the end. Love your rugs and paint choices. I hope you feel better very soon, and watch out for the new crazy virus - it's scary! oh my gosh, I'm laughing so hard! My hubbs knows I tease him here on the blog, whenever I get a chance! I think you made the right choice in removing the cabinets and counter. Your hutch will look so pretty there. Try to rest and get ready for ...more work! So happy for you that things are moving forward and all got so much done over the weekend. 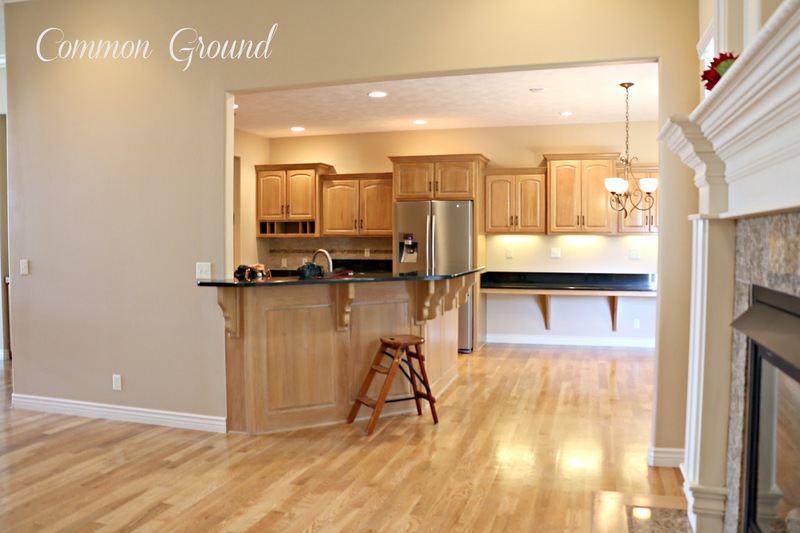 I would of moved the cabinets too and will really open up the area. 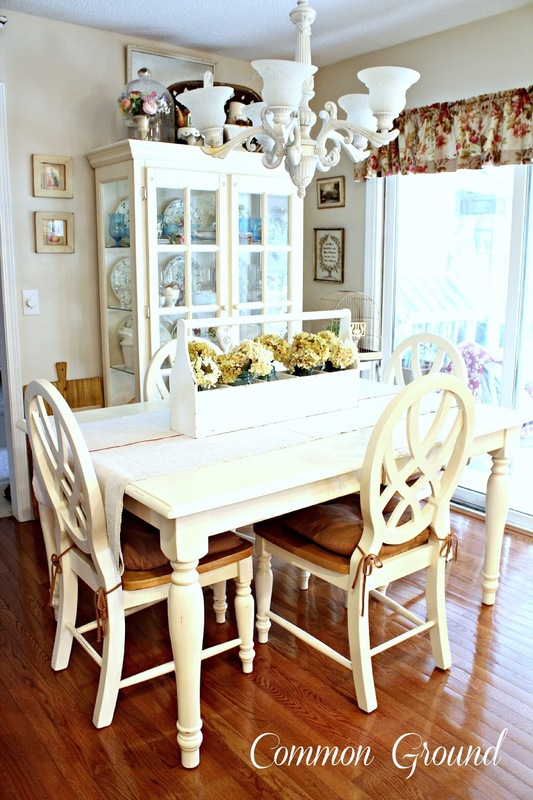 Your china hutch will look so much prettier that the cabinet/desk area. Your hubs is very obliging to crawl in that niche, do you lend him out? Hope you feel better soon. Don't overdo it! yeh Cathy, it was his idea, so I let him have all the fun! So glad you're making progress! I thought I was going to have some sinus problems last week, with my throat hurting and my ears feeling like water was sloshing around in them, but luckily it went away. I don't know about those TV niche things. I'm glad I don't have to have a TV in the living room. But I know most do. Oh it is all looking so good. Can't wait to see more. Glad it's coming along so nicely for you! I can see why you'd move the cabinets and "homework" station. I think your china cabinet will be beautiful in that area. Hoping you are feeling better very soon! The rug is very pretty and although the painting is a big job, I'm sure it is going to look nice and fresh. Take care! Love the rug, Debra! Of course, that could be because I have a similar rug in our living room. 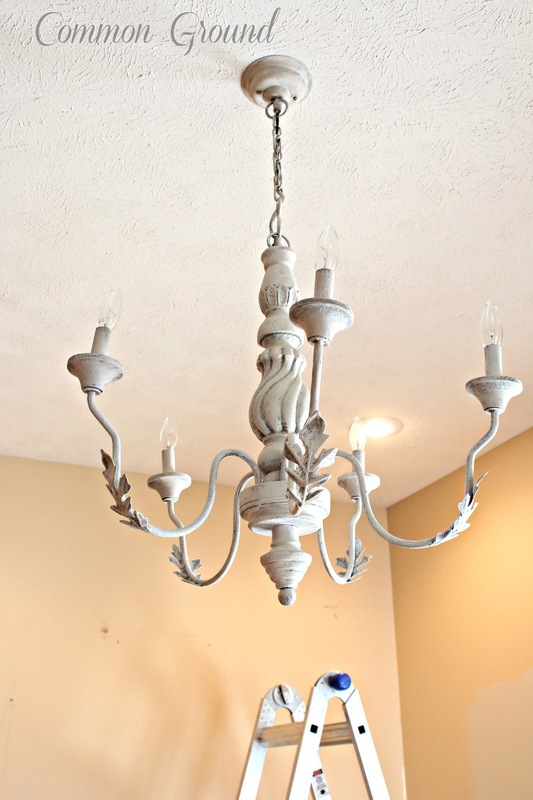 : ) The chandelier looks great and I can't wait to see this room painted. 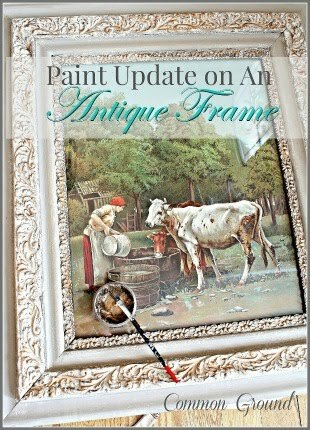 I now have to start looking at paint colors since my hubby did some patching and scrapping in our master bedroom and the walls now need to be painted. There's no putting it off at this point! I have no idea which way I want to go with color in there so I am kind of dreading that whole process. Sounds like you've been busy:-) How fun to start from scratch on a new house and I'm sure you can't wait to get all your goodies in there. It must be the moving virus because I too have had that nasty sore throat and stuffy nose. Get well soon. You are making amazing progress. Too bad you aren't feeling well, Debra...hope it passes quickly! 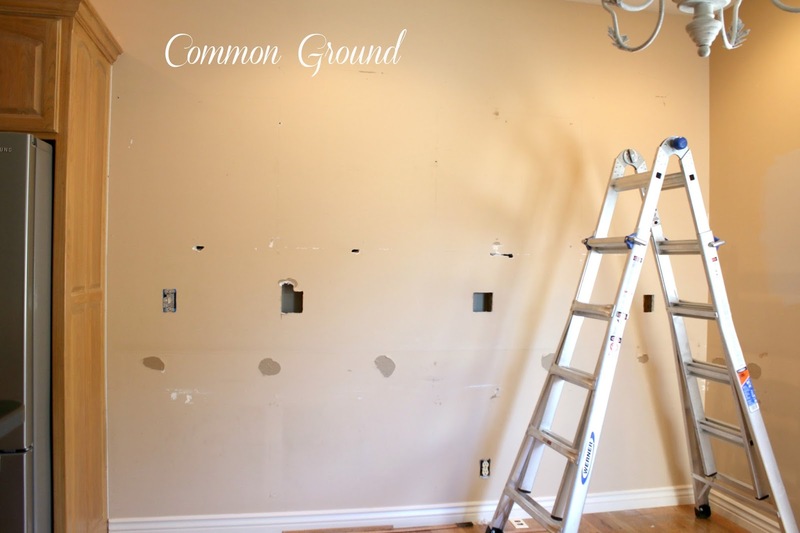 I love the decision to remove the cabinets...it's going to look wonderful! I think taking out the wall of cabinets is brilliant! The space will look so much cozier with your hutch and table and chairs placed there, plus it gives you a place to show off all your wonderful treasures. I'm glad your paint color turned out to be the color you hoped for so now you can run with it! 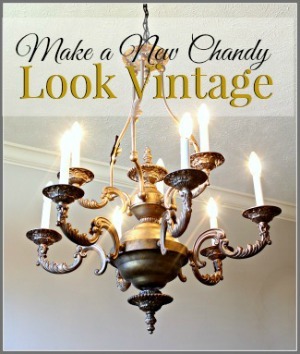 Loving your chandy and I hope you had some chicken soup for dinner and take it easy tonight! 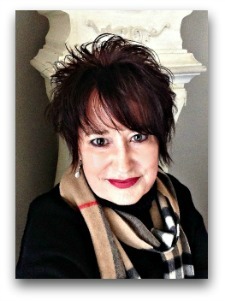 Thanks for sharing your progress, Debra! Debra...I am visiting via Savvy Southern Style. I have been looking fora black wool oriental rug. Would you mind telling me where you found yours? We moved abt two years ago...and I am continuing to do house fluffing even though we had everything painted an new hardwood installed before the move. So much fluffing goes into making a house a home. Feel better. Such a bummer to get sick when your are busy. Hi Sheila, I found mine on Overstock. They have several great black rugs to choose from, and great prices too! So sorry you're sick!! :-( But wow! What a lot of work you've gotten done and I cannot wait to see how you transform that homework desk area. I know it's going to be gorgeous! Love the chandy and the new wall color is perfect with it!! And the rug is perfect, did not like the other one, it would fade away with the floor color. Good idea to remove the cabinets and desk area.....your pieces are going to be gorgeous in there!!! Rest!!! Oh this place is going to be so gorgeous Debra - you must be over the top excited ! Sounds like you picked up that virus that is making the midwest rounds!! I love what you are doing! 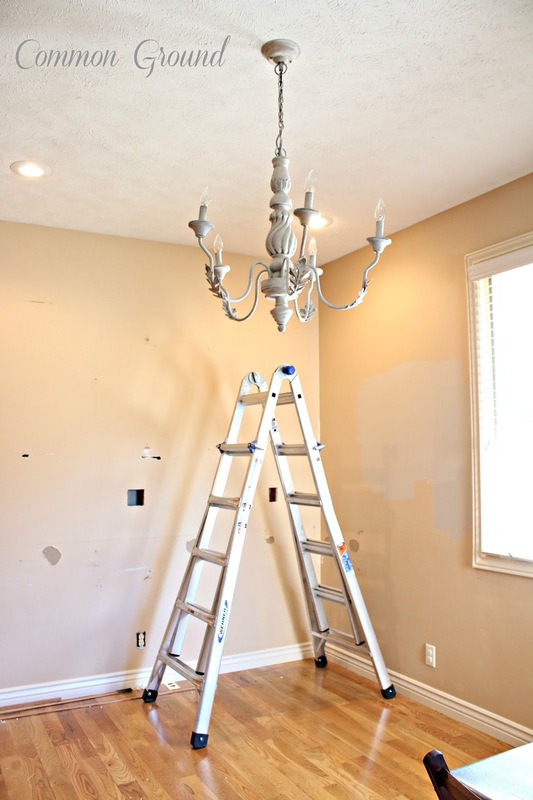 The paint color is wonderful and that chandelier is definitely a wow! whatever this is it's a nightmare. I've been sick in bed for four days...it keeps morphing in to something different just when I think I might feel better. Looking so good so far! That usually happens to me too.....getting really into a project, wanting to get it done and then I get sick!! Take care...it will be waiting for your when you feel better! Hope you are feeling better soon. 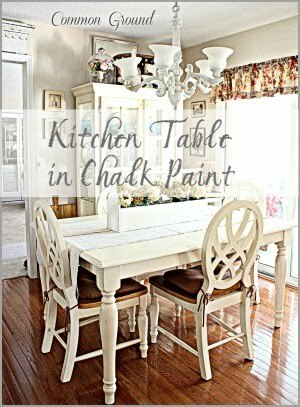 Love the paint color and I know when you get your table and cabinet in the room it will look gorgeous. Woooo Hoooo so happy you are making this place your new and beautiful home. Love the paint color by the window...cannot wait to see it finished but take care of yourself.. 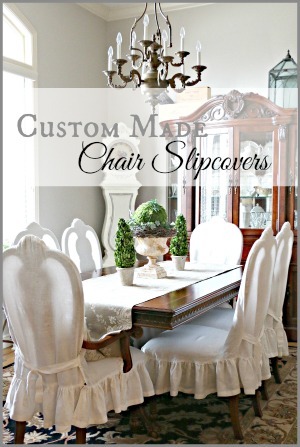 I love the color also, but that white dining set is what really catches my eye. Love it! gorgeous chandy!! Everything is coming along so beautifully!! Right there with ya with the laryngitis, yuck. Great idea to move the cabinets to the utility room. Now, you have the space in the kitchen without giving up the storage. The chandelier is perfect for this room. 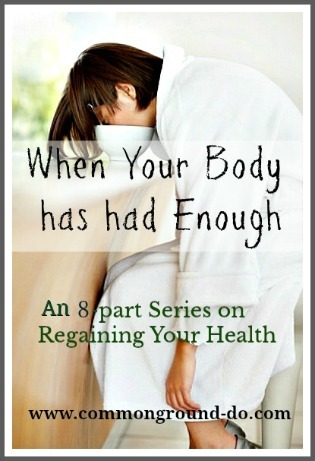 Maybe you are feeling a little better now. Hi Debra, hope you are feeling better! Hubby had that same thing a couple weeks ago. Things are coming together nicely. I don't blame you for wanting that space for your cabinet. I think it will really look nice! Things are looking real good Debra...I love what your doing in the kitchen!